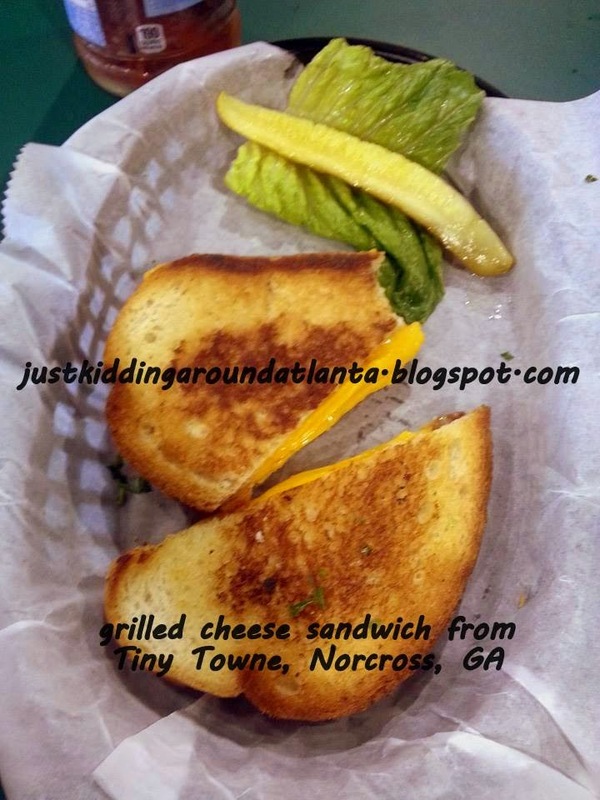 This week David & I were very excited to visit Tiny Towne in Norcross, GA. I heard about it from a friend and it sounded like a cool place. 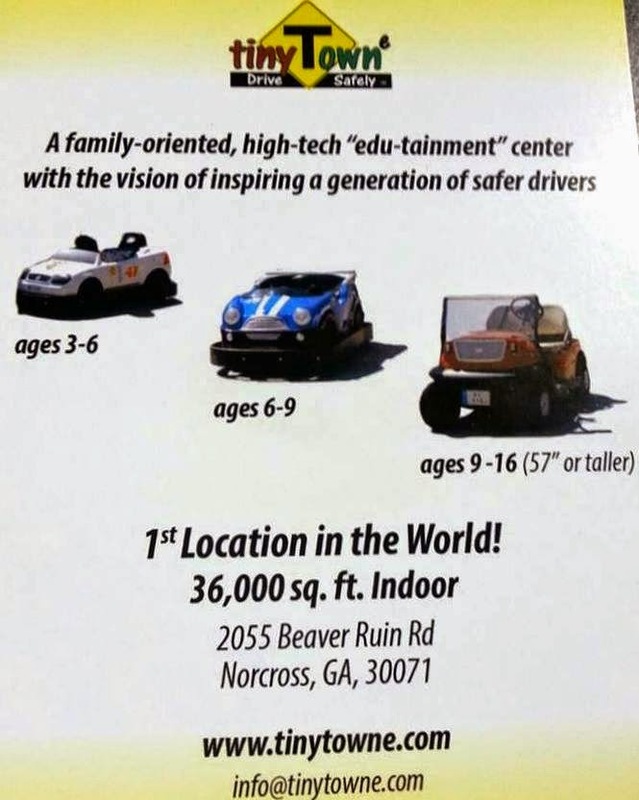 I checked out their website and discovered it's a large indoor "edu-tainment" complex where kids from ages 3 - 15 learn all about the rules of driving and being safe on the road. 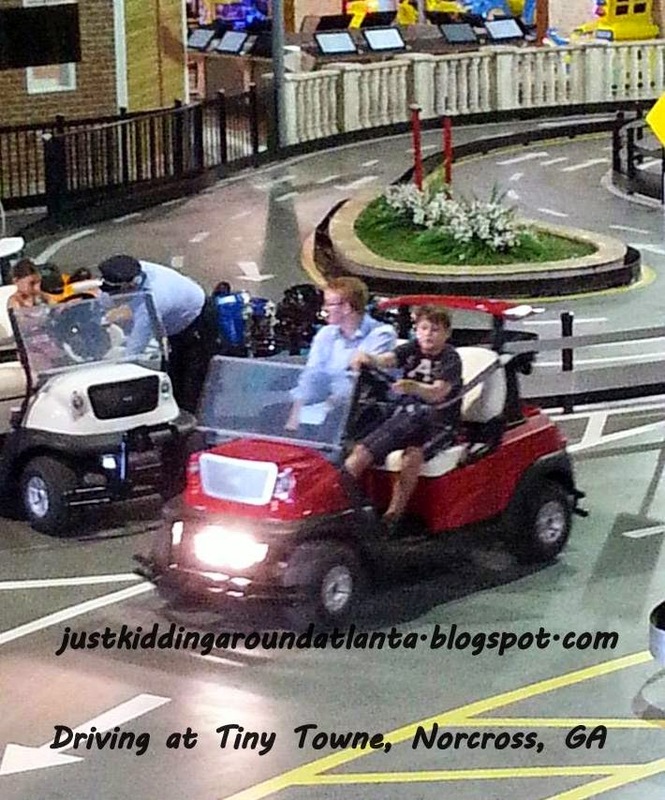 They get to drive cars (different sizes according to their age). 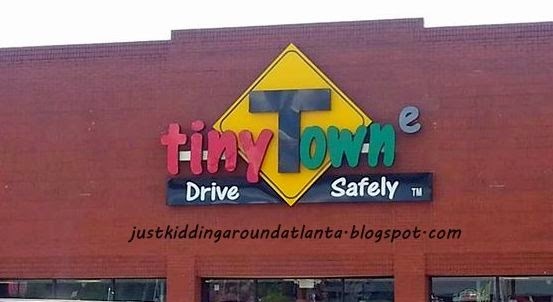 Tiny Towne believes learning should be fun, and strives to inspire the next generation of safer drivers! 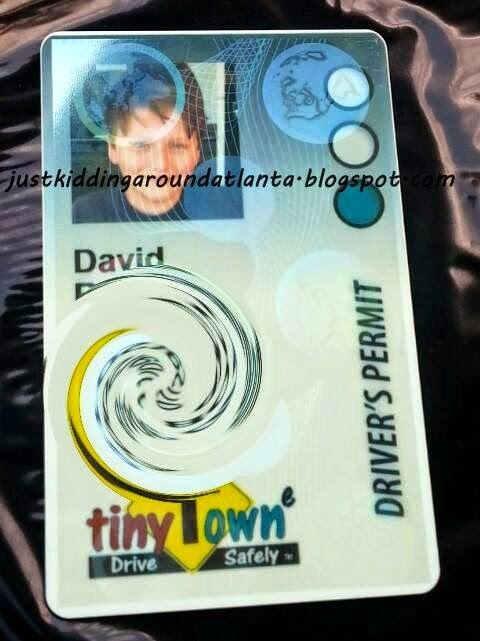 I love the idea of David learning about safety and driving rules while he is still young. This is the first Tiny Towne location in America. 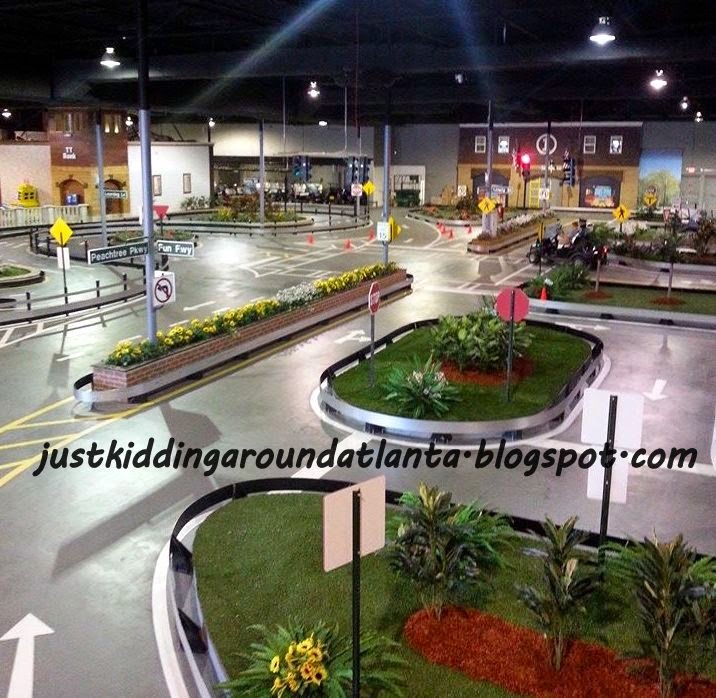 According to the website, there is a similar driving edu-tainment park in Lebanon called Rio City, and based on its success, they brought the concept to America. So glad it is close to us! I wasn't sure what to expect, but when we arrived David got his driver's permit, and we were given a wonderful tour of Tiny Towne by Rebecca. It really is like a town, with streets, red lights, stop signs, etc. Rebecca introduced us to Pierre Maalouf, the founder of Tiny Towne and I told him I think this is the coolest kids place ever! Kids won't even realize how much they are learning - they just think they are having fun! On our tour we discovered two "street" tracks - one for younger kids, and one for kids 57" and taller. Circling these tracks are painted train tracks, for the train kids can hop on and ride around the "towne", finishing up with a trip through a tunnel! Towards the back of the building you'll find a large computer classroom with touch screen computers. 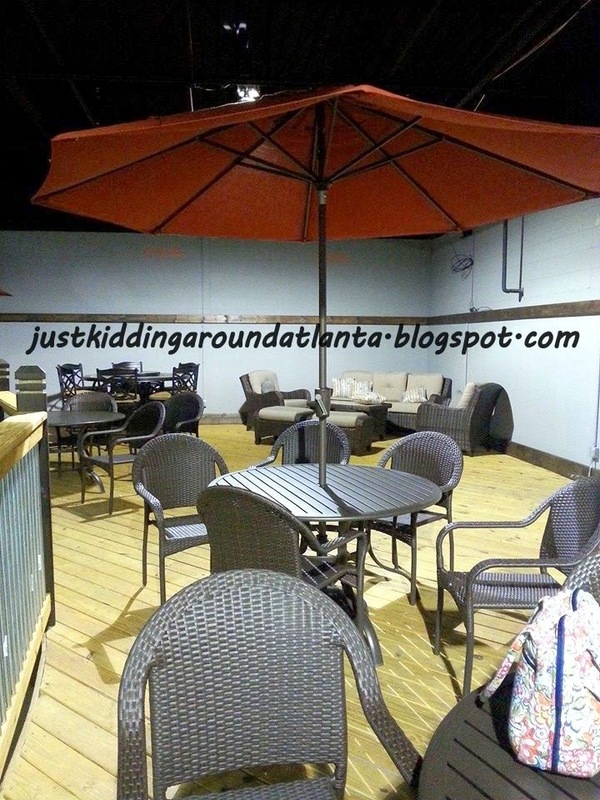 It is just perfect for field trips, and they also have several party rooms. I hope to set up a field trip for some of our fellow k12.com homeschool families here this Fall. 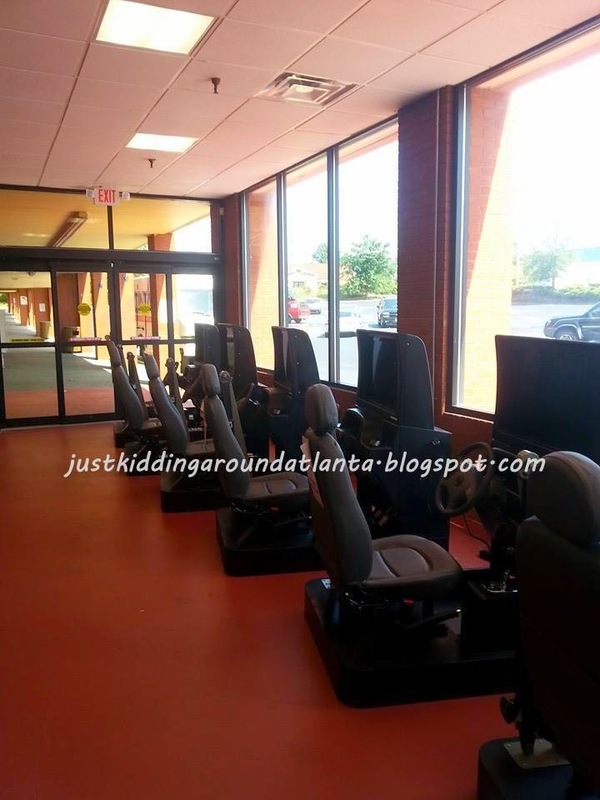 At the front of the building there are simulators for testing the older kids before they actually drive on the tracks. 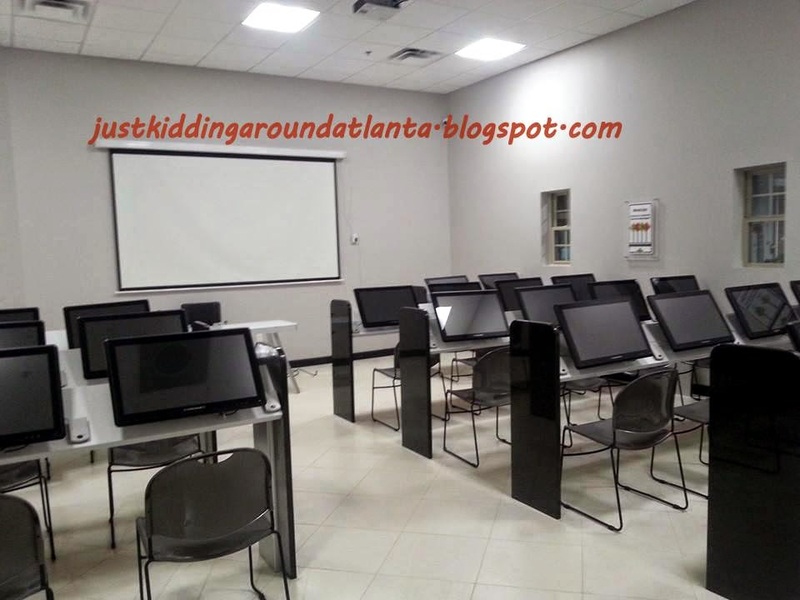 There is also an area where the bigger kids take a computer test that they must pass with 100% correct answers before driving. Don't worry, little kids don't have to test! Tiny Towne has a cute "Carcade" game room too. Upstairs (actually over the tunnel) is a comfortably furnished deck for parents to sit and watch their drivers navigate the tracks. And when you want to take a break from all the fun and learning, there is a nice restaurant called The Grill where you can order lunch or a snack. 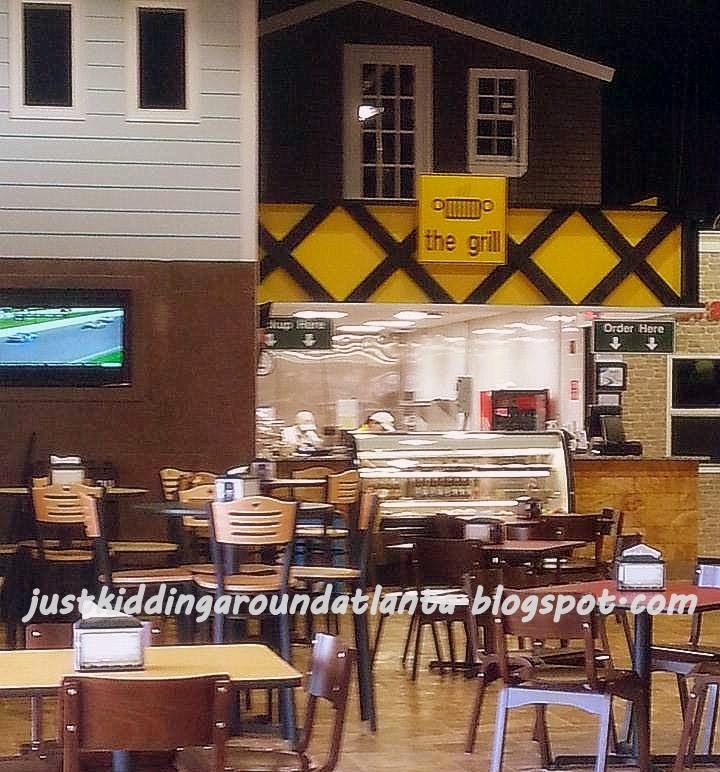 The Grill - a great spot for a quick meal or a snack! As mentioned above, David had to take a written test first. It took him 4 or 5 tries to get 100%, but he was learning with each retest so it didn't take long to ace it! There were park benches nearby for parents to wait. 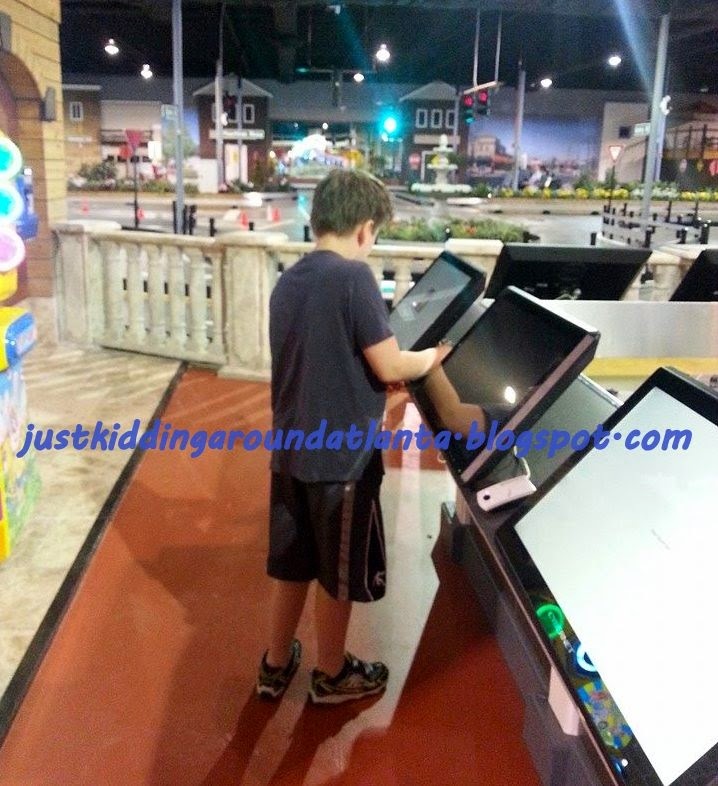 Next he had to spend time on one of the simulators up front. Pierre helped get him started on that. It was like a video game, but more realistic. He learned to shift, use the turn signal, use the rear view mirror to check for traffic, and then how to maintain speed. He did a great job, so next it was time for a smart cart on the track! He went out on the track and I went up on the deck to check out his skills! I was pleasantly surprised - he did a great job! I really like that they have realistic street signs, traffic lights, and even police officers patroling the streets of Tiny Towne. And yes, you can get a ticket! (Luckily, David didn't!) After about 20 minutes of driving, we spent time having fun - playing air hockey and other games in the Carcade. By then it was past lunch time, so we grabbed some tasty sandwiches and chips over at The Grill. They had a variety of foods that kids will enjoy (pasta, sandwiches, pizza) plus salads, appetizers and desserts. To sum up our wonderful day of learning and fun at Tiny Towne ~ we love it and plan to go back after school starts! It's a unique learning experience for kids and parents will enjoy themselves too. Thanks for having us for the day, Tiny Towne! Tiny Towne offers yearly membership options, and you can read about driving for each age group here. 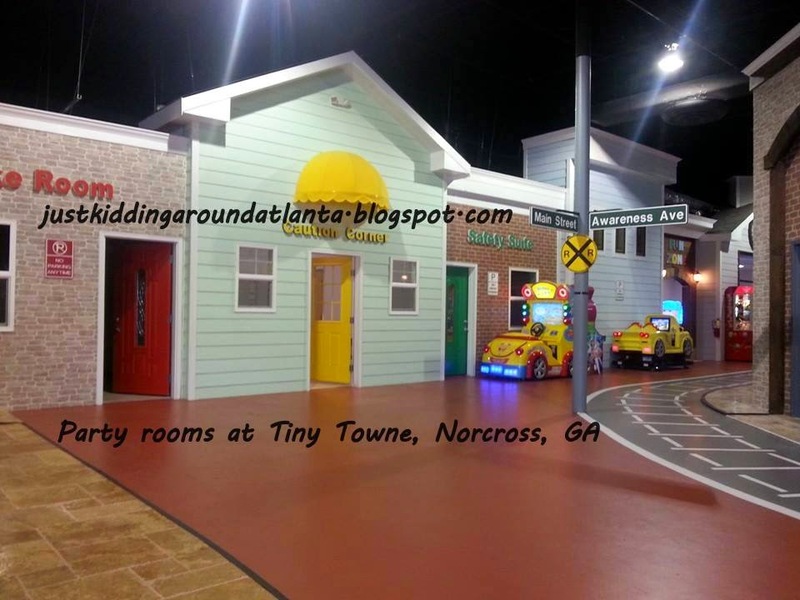 Admission to Tiny Towne complex is free, but attraction prices vary. To find out prices, hours, and directions, click here. Follow Tiny Towne on FB. Please use the twitter and facebook share buttons at the top of this post to share this review with your friends! 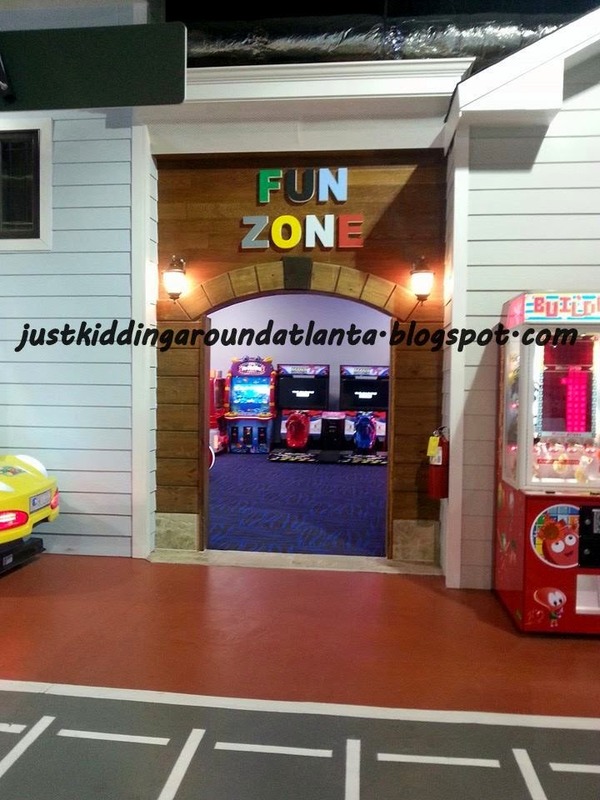 Let's spread the word about this great new attraction in Gwinnett County! Thanks for stopping by! Disclosure: David received free track time and tokens to allow us to visit Tiny Towne for this review. No other compensation was received, and opinions stated above are 100% my own! This place sounds like a lot of fun, I'll need to take my girls there. It is such a great place. They will love it! Wow! What a cool place! I love that it looks like a real town. I bet kids absolutely LOVE it! 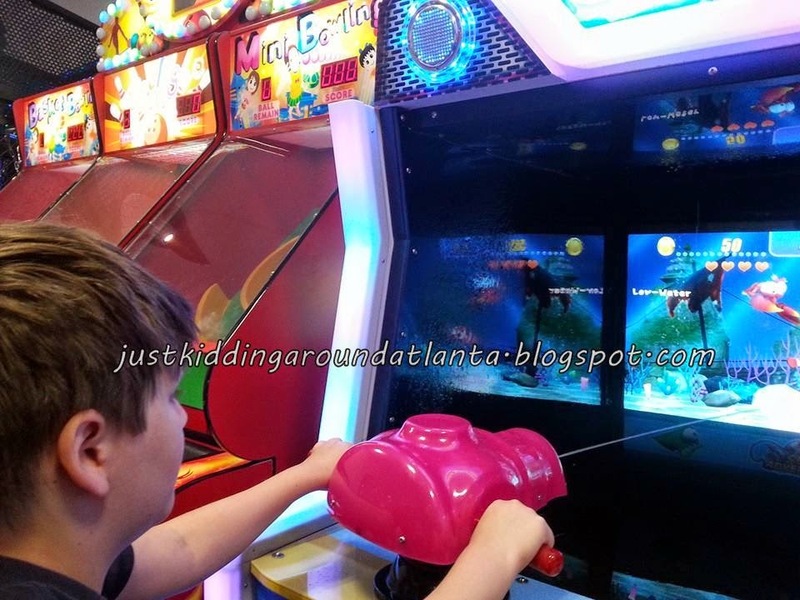 It is so much fun - and it really is like a kid-sized town! My son is already asking when we can go again! What a great review, Aimee! It feels as if I was there! Like Kimberly, I love that Tiny Towne looks like a little city. 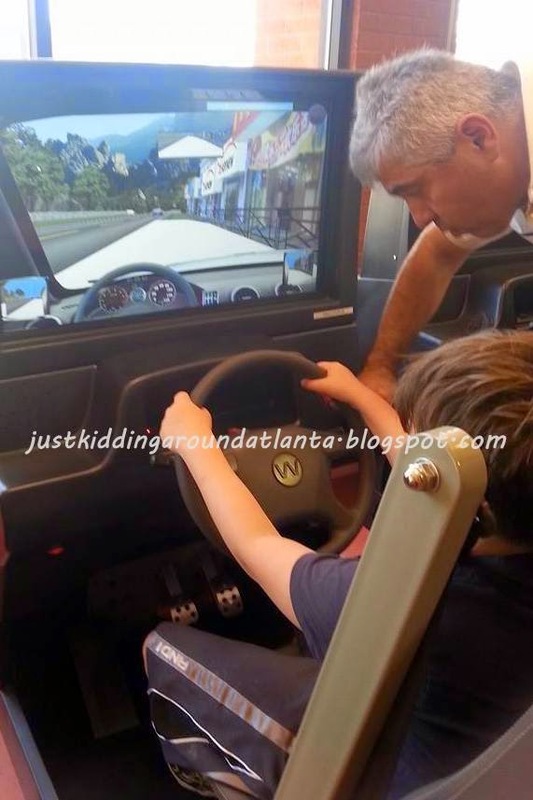 My 4-year-old would have a blast learning to drive and sitting in the simulator. We'll have to schedule a day to visit soon! Thanks so much, Courtney! I had such a great time while we there. Anything that makes my son have a big smile, I am all about sharing it with others! They are only little for such a short amount of time. I hope you have as much fun as we did when you visit Tiny Towne! Oh wow! This sounds like as great place. I'm certainly planning on taking my kids here. Thank you so much for sharing. 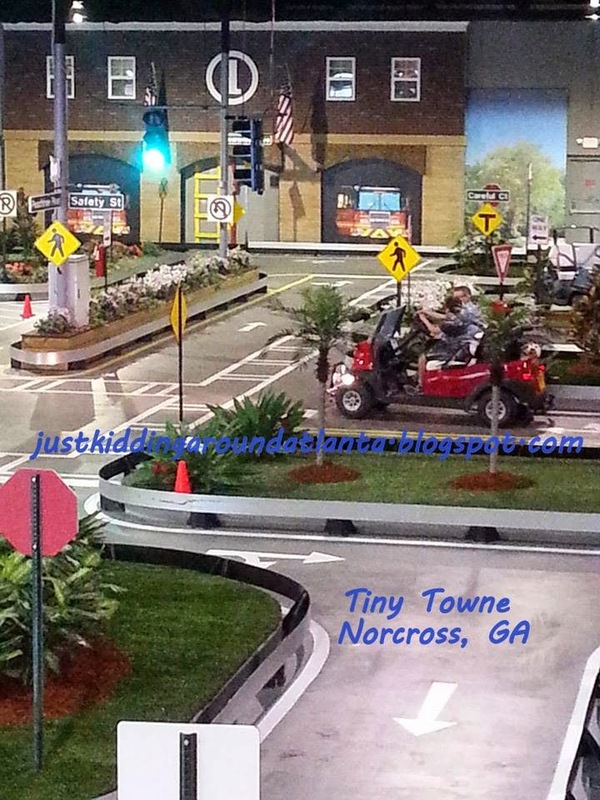 Tiny Towne looks like so much fun! The city concept is so much fun. My girls would love to go here!